Alan talks about being a baker. Todd: Now Alan, you used to be a baker. Todd: That’s pretty cool. So you can make anything right, like bread, donuts, cake? Alan: Yeah. My specialty, what I did a lot of was, different varieties of bread. I baked a lot of white bread, whole wheat bread, 60% whole wheat bread, rye bread, sour dough, Italian bread, French bread. So mostly I did breads. Todd: Ok, sounds good. What is the routine of a baker? Do you have to get up early, or how does that work? Alan: Yes. Generally most bakeries, especially bakeries that sell bread, they start operations very early in the morning. With the bread, you want to get the bread out and fresh as early as possible. So bread bakers will start at 3am or 4am. They’ll come in and open up the shop. They’ll get everything going, fire up the ovens and start mixing the bread dough. So if the bakery opens at 8 in the morning, the customers come into fresh baked bread. Todd: I love that smell. So what would you say was the best thing about being a baker? Alan: The best thing about being a baker would be, making all those fancy pastries: Danish, croissants, apple strudel. I enjoyed that part of baking, making those kinds of products. Todd: Was there anything that you did not like about being a baker? Alan: Pretty much everything else. Specifically, I didn’t like the hours. Mostly the hours I didn’t like. The actual work was not bad but it was the hours and the pay wasn’t so good. Todd: Ok well, still though you’d have to have loved that smell of fresh bread everyday. Alan: That I did enjoy yes. My specialty, what I did a lot of was, different varieties of bread. His specialty is pasta. The sauce is always incredible. I didn't know that cookies were your specialty. 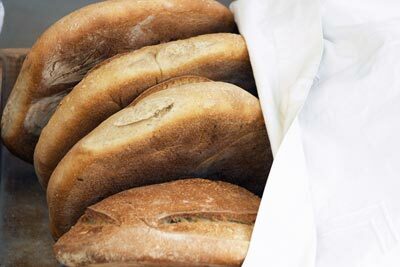 Generally most bakeries, especially bakeries that sell bread, they start operations very early in the morning. We don't open until 8am, but we usually start operations around 5am. The store isn't open yet, but the factory has started operations. They’ll get everything going, fire up the ovens and start mixing the bread dough. Make sure you fire up the grill thirty minutes before you want to start cooking. Did you fire up the heater? It's really cold in here. The best thing about being a baker would be making all those fancy pastries. She brings pastries to work every Friday morning. Coffee is always best with a pastry. Specifically, I didn’t like the hours. I feel like I never sleep. These hours are killing me. After she had a baby she decreased her hours at work. We only start about 30 minutes before we open, so if you get here too early, you will have limited options. I'm not the best cook, but Mexican food is my . These hamburgers are ready to cook. Why don't you the grill? What are your like during the week? There will be and coffee at the meeting.